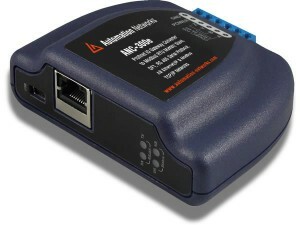 ANC-300e: Any Combination of Ethernet to RS-485 / Ethernet to Ethernet Protocol Conversion. $525 USD List. Modbus Sniffer, A.O. Smith AIN, A.O. Smith PDNP, BACnet MS/TP Client, BACnet MS/TP Server, TCS Basys Master, MSA Chillgard Monitor, DMX 512-Master, DMX-512 Slave, M-Bus Master, Metasys N2 Master, Metasys N2 Slave, Siemens FLN Master, Siemens FLN Slave, Sullair Master, Toshiba ASD Master, Toshiba PLC Master. Ethernet/IP Client/Server, AB CSP Ethernet Client/Server, Modbus TCP/IP, Profinet IO, BACnet/IP BBMD, BACnet/IP Client, BACnet/IP Server, Baumer VeriSens Client, CC-Link IE SLMP Client, MELSEC Client/Server, Generic Socket Client/Server & GreenFumeHood Client. ANC-300e is an easily configurable Ethernet / RS-485 converter gateway, that provides integrated communication between all the above common industrial and commercial communication networks. As part of the ANC Gateway Converter Series, the ANC-300e provides a common platform which is convenient and easy to setup in all products. The Automation Network ANC-300e Ethernet & Fieldbus Gateway Converter allows data to be seamlessly transferred between Ethernet to Ethernet and Ethernet to RS-485 networks with simple configuration. The Automation Networks ANC-300e provides an IEEE 802.3 10/100BaseT Ethernet port and an RS-485 port (4-wire terminal block style). The Ethernet port allows standard CAT5-type 8-conductor unshielded twisted-pair (UTP) patch cables and allows multiple protocols to communication at the same time. The RS-485 port supports multiple protocols. The ANC-300e alarming systems allows up to twenty individually-configurable, with email notifications. It has the ability to program a configurable network timeout action which provides a fail safe condition for each database address in case of a network interruption. You can easily construct complex data conditioning functions with PLC-style logical, arithmetic and filtering database manipulation operations. The Automation Networks ANC-300e is a member of all the ANC Gateway Series product family. Members of this family are designed to provide a uniform interface, configuration and application experience. This commonality reduces the user’s learning curve, reducing commissioning time while simplifying support. Setup protocols, network parameters, and object definitions of the client/server. Use the grapics with the real-time internal database.